Guns, Gore and Cannoli takes a tried and tested formula and creates a fresh blend by drawing inspiration from a number of different sources – making for an enjoyable old school sidescroller. When we first saw screenshots for Guns, Gore and Cannoli, it reminded us of the Shank games and Mark of the Ninja, both by Klei Entertainment. This is mainly true of the cartoon-esque art style, combined with a familiar sidescroller view. 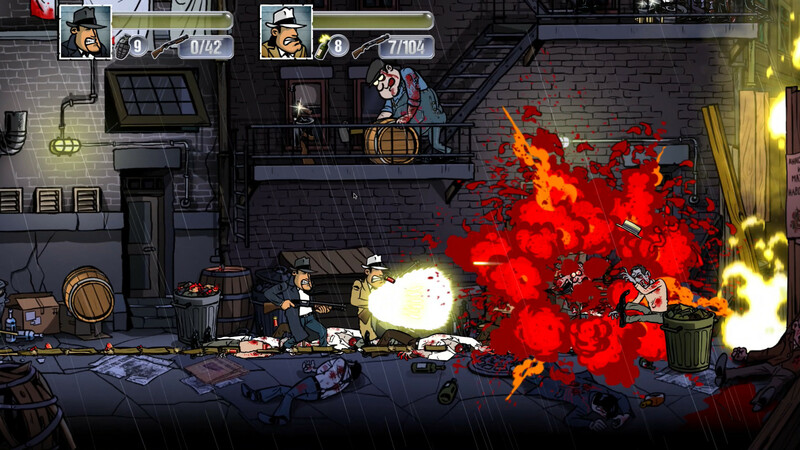 Gameplay-wise, the game resembles the classic Metal Slug series – with a heavy dose of Mafia-inspired symbolism and visuals thrown into the mix for a change of scenery. It’s a game that doesn’t take itself too seriously either. Fairly early on, you’re made aware that this isn’t just a gangster version of Metal Slug… and this realization comes the second you first encounter zombies. That’s right… zombies. The action then quickly becomes frantic as you set out to find fellow gangster Frankie amidst this giant outbreak of the undead. Over the course of the three to four hour adventure, you’ll encounter and use a couple of different weapons – and shooting’s a giant part of everything that goes on around you. It’s not just zombies that charge (and even swarm) you, you’ll also have to fend off the police and opposing gangsters on your journey. Aside from going on this adventure alone, you can also have friends join in for some multiplayer antics. Local multiplayer antics, I might add – still the best kind! It’s all a lot of fun, even though it’s not something that will revolutionize the genre – much like the endless Metal Slug sequels. What Guns, Gore and Cannoli does very well is that it has the basic formula for games of this type down. If that’s your idea of a few hours of old school fun than be sure to look at this game when you’re in the mood for something nostalgic yet fresh.